What is it? Grilled pieces of meat on a pita with cucumbers, onions, tomatoes and “special sauce,” which was either some sort of tomato-based red sauce that I’ve yet to decipher, or the more typical tzatziki (tzat-seekie), which is a yogurt-cucumber-dill-garlic sauce. Basically Greek mayo. You could commonly get pork, chicken or lamb. I’d alternate depending on my mood. Well, lamb is really close to venison, so here you go. Venison souvlaki. While it sounds all exotic, it’s basically Greek tacos. Really good, super fun to eat. The diners and roach coaches made the sandwiches for you, but I like to lay everything on the table and let people make their own. 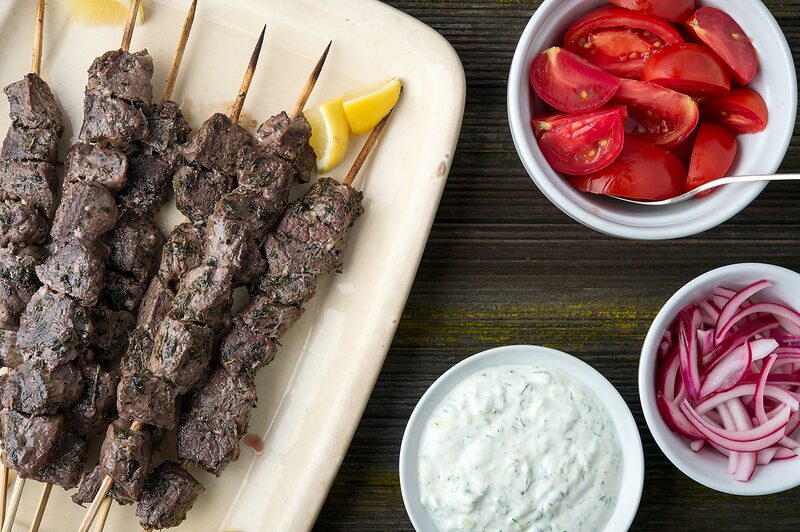 Making this souvlaki recipe is pretty straightforward, but you do need to remember one thing: Your grill or flattop or frying pan or whatever needs to be really hot. The reason is because the meat is in small pieces so it needs to cook fast in order to not dry out. Blasting it with the grill cover open will get you there pretty well. But keep an eye on your venison, as it can go from rare to medium to “aw crap I wrecked it” in about 2 minutes. Remember it is better to have nice, tender meat than pretty grill marks on the outside — this is a sandwich, after all. You can’t see the grill marks, but you sure as hell can tell of the meat’s overcooked. Any Greeks out there? 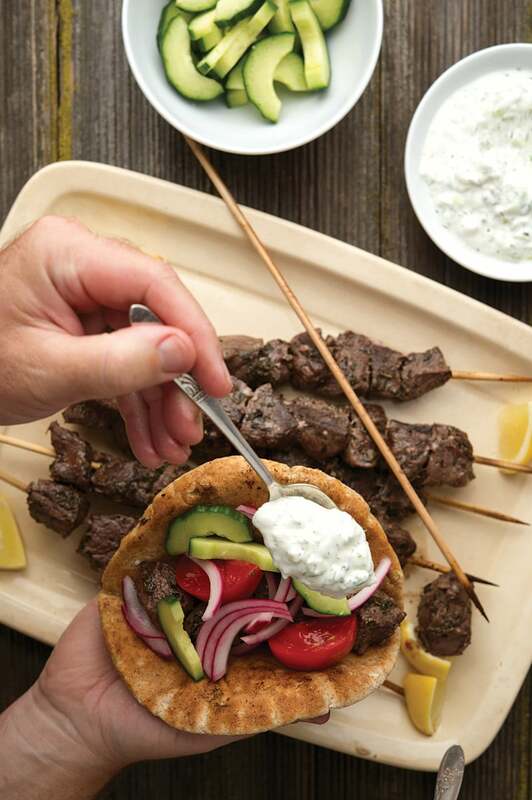 How is your souvlaki recipe differently from me? I’d love to hear about regional differences. I of course do this with venison, but the base recipe in Greece would be with lamb; pork and chicken are also traditional in Greece. Basically this is like an American "taco night," where you lay everything out on the table and let everyone have at it. Fried potatoes are a common alternative to the pita breads, and I see lettuce as a garnish pretty often, as well as chunks of feta cheese. Once in a while I see those awesome pickled Greek pepperoncini peppers, too. They add a nice kick. There are a bunch of make-ahead steps here, so if you are pressed for time you can make the tzatiki sauce up to a few days ahead, and marinate the meat a full day a head of time, too. 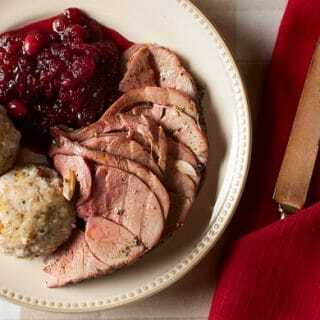 When you are cutting your venison (or lamb, or beef, for that matter), make sure it is free of all silverskin and sinew. This will make the meat easier to eat in the pita. Cut them into smallish chunks -- remember, you are going to eat this as a sandwich of sorts, not as a big kebab. Add the meat to all the marinade ingredients in a sealable plastic bag, mix well and put in the fridge for at least 2 hours, and up to a full day ahead. Meanwhile, make the tzatziki sauce by mixing all of those ingredients together. Keep that in the fridge until you are ready to serve. Chop all your accompaniments: Tomatoes, cucumbers, lemons, red onion, etc. If eating raw red onion isn't your cup of tea, soak the sliced onion in lemon juice or white wine vinegar while the meat is marinating. This quick pickle will pull the harshness right out of the onions. When you are ready to rock, get your grill very hot. Make sure the grill grates are clean. Salt the venison liberally, and skewer the venison pieces together -- this is not how I normally do meat skewers, but jamming them all together helps keep these small pieces of meat from overcooking. Lay the skewers on the hot grill and cook them with the grill cover open until they are medium, about 4 minutes per side depending on how hot your grill is. I use the finger test for doneness to determine when to pull the meat off. Keep it on the skewers while you take it to the table. To serve, lay everything out and let people make their own little pita wraps. Serve with a nice light Greek red wine, a dry rose or a crisp beer or three. Hi Hank, Just found your website while looking for a different way to cook with Venison. Just one quick question, why no salt in the marinade? I always thought salt was a staple in meat marinades. Thanks for the awesome website!